Three miles on the dreadmill Tuesday night. Somewhat painful. There’s one spot deep in my right quad that’s coming along the slowest. Four miles at lunch Wednesday. Uphills, pretty good, downhills pretty painful. Five miles at lunch Thursday. It was mostly flat but I felt pretty good even on the few downhills. Just that last little spot in the quad complaining at all. Ah, ultra-marathon recovery… gotta love it. Sunday I was pretty sore but Monday was even worse. There was no way I was running Monday night, but I did make myself go for a three mile walk. Walking uphill was fine, walking downhill was painful and awkward. The legs are feeling a bit better today and I will probably go for a slow jog tonight. Like I said, it was cold before the start. It always is. 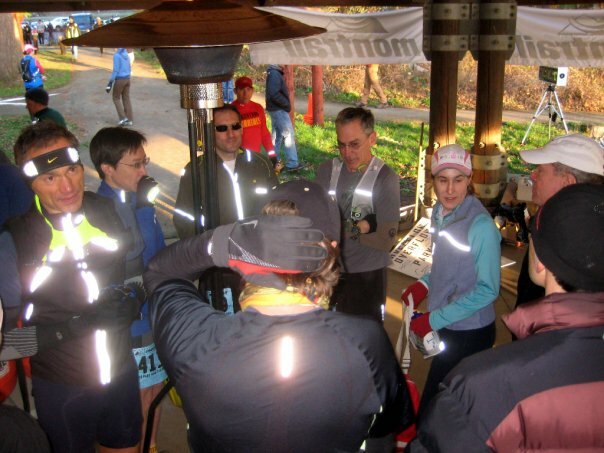 This is what runners look like when they huddle around a heater. 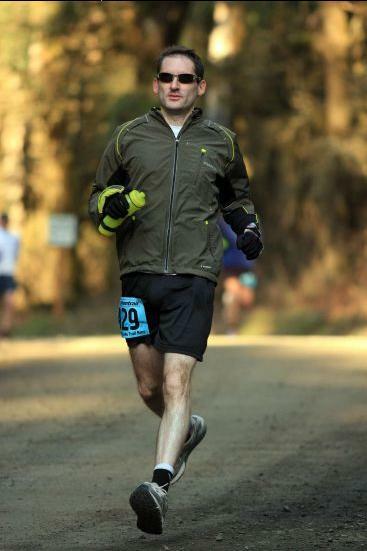 This was my third year in a row of running the Hagg Lake 50K. And for the third year, we had nice weather. Bright, sunny and cloudless. It was chilly before the start — right around freezing — but things warmed up quickly once we were moving. 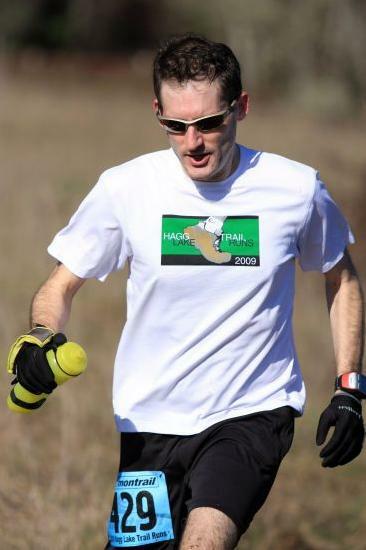 In 2008, this was my first ultramarathon and my first trail race, and my main goal was just to finish. (Though breaking six hours became an important goal by the end of the race that year.) In 2009, I had run a six-hour race just two weeks before, and I was dealing with some behind-the-knee tendonitis or something, so once again… my main goal was just to finish. This year was the first time I’ve come into it mentally and physically prepared, and I had a time goal: beat 10 minutes per mile, 5:10:00. Just for some perspective on what a middle-of-the pack runner this makes me, let’s look at what yesterday’s winners did. Max King won the men’s side. He’s ridiculously great — he’s won multiple trail running national and world championships. He ran a 3:26:54 yesterday. A 17-minute course record. Frickin’ 6:40 per mile! That might not sound that amazing to you if you are used to flat roads, but I can’t even get a mental picture of how you would begin to keep up that pace over 31 miles of those hilly twisty slippery trails. Salem’s Pam Smith won the women’s competition in 4:18:34, placing 8th overall. Pam is an amazing runner who really needs to change the name of her blog. I wore a jacket just for the first three miles. As planned, I took the first seven or eight miles — whatever the distance is up to the first aid station — pretty easy. I was still out a little faster than I wanted to be, according to the Garmin, but it’s hard to say for sure. The Garmin’s not of much use at a race like this. Its accuracy in hilly terrain with switchbacks isn’t great. Later on in the race, I accidentally hit the stop button, probably when I stumbled and nearly fell. So I don’t have any even-close-to-reliable split data for this run. That’s OK. The race had new organizers this year — Kelly, Todd and Fuzz — and they did a great job. Things seemed to run just as smoothly as ever, plus they did an amazing job of pre-race communication via email and facebook updates. Nothing seemed left to chance. As always, all the volunteers out on the course were awesome. And I can’t forget to mention — this year we not only got shirts, but we got finisher’s socks. Look for me to be sporting my swanky new Hagg Lake socks soon. I picked up the pace after that first aid station, and started running all the uphills as well. My goal was to push myself during a full loop around the lake — in other words, for the approximately 14 miles back to that same spot. Except for the two aid stations along the way, I ran every step of those 14 miles. My training this year allowed me to pull that off… in previous years it would have been impossible. I passed a lot of people, and got passed by very few. The mud conditions this year were, of course, pretty good compared to how they could have been if it were rainy. But the consensus seems to be that the mud was worse than last year. I agree. There was one section that some construction work has apparently turned into a giant 100 yard long pure mud field. Most of the trail isn’t like that, of course, but on average things seemed a little more slippery and a little more wet than in 2009. If the whole course were like this, I would finish sometime next Tuesday. After my 14 miles of pushing it, I had two-thirds of the lake to get around before I was done: less than ten miles. It is impossible to express how long those ten miles take. During those ten miles, you think to yourself “why do I do this?” and “how could I have ever looked forward to this” about six thousand times. Then you remind yourself that negative thoughts don’t help. Then you try to breathe and try to move and wonder if just stopping would be so bad. And your quads hurt and your hands are covered in mud from catching yourself when you almost fell and worse yet you also got mud on your water bottle and even though you wiped it on your shirt you can still taste some of the mud that got into the nozzle and you know you shouldn’t be tasting stuff that smells that bad but you have no choice, just like you have no choice but to keep moving forward. When I got to the last aid station, I asked if anyone had an elapsed course time, since I had by then noticed that I had accidentally stopped my Garmin. They reminded me that the race had started at eight, so I could go by time of day. They also claimed I only had 4.5 miles left to go. Having run those particular “4.5” miles five times before in my life, I put no stock in this obviously fraudulent claim: it’s really about six hundred miles between the last aid station and the finish. But just for fun I sized up what the situation would be if I were in a parallel universe where this “4.5” miles business were true, and it looked like I had a good shot at 5:10:00 and maybe some chance at five hours flat. I wore gloves during the first lap of the lake and took them off for the second. There are no pictures from the second lap because our horrible grimaces would melt the cameras. With about a half mile to go, I passed someone (probably a 50K early starter) and told him that “there’s a good chance we won’t die.” I had 5:10 in the bag and no shot at all for 5:00, so I hadn’t pushed the last two miles hard. Just the normal baseline agony. Relatively speaking, I was in good shape after finishing. No blisters. No tendon- or joint-type pain. My legs were painful but less so than after previous races. System-wise I was a little shakier. I was completely exhausted and I got head rushes rising from a seated position. My right arm tingled a bit as my blood flow readjusted out of workout mode. I needed a nap but I’d had too many caffeinated gels during the course of the race to let sleep come. In other words, I was on top of the world! You can laugh at anything when you don’t have to run another “4.5” miles. 5:06:something. A personal best by 33 minutes! No blisters, no injuries, complete exhaustion. More later. Very careful followers of my blog may have noticed that I’ve added a new “Upcoming Race” over in the sidebar. I signed up yesterday for the Mount Hood Pacific Crest Trail Ultramarathon. It’s in late July. It’s on trails in the mountains. It’s fifty miles. 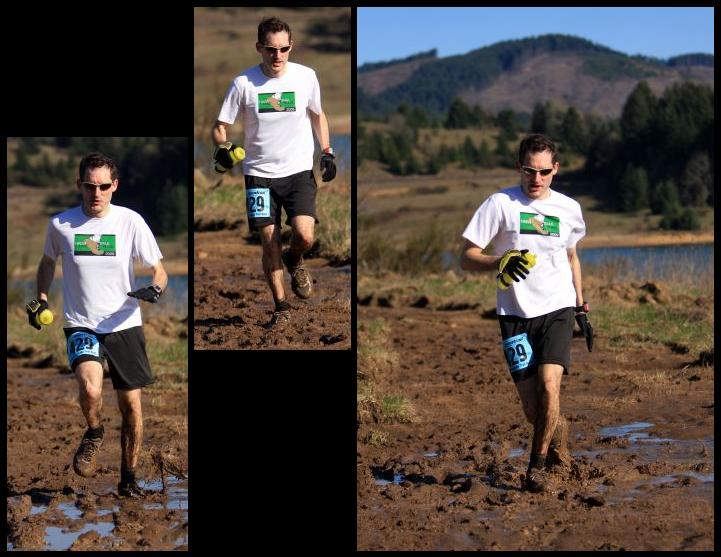 Three days left until the 2010 Hagg Lake 50K! It looks like we may be getting lucky again this year as far as trail conditions go. I’ve been training very well for the last eight weeks, with over-40-mile weeks for the last five. My 24-miler went fantastically. If the trails are decent, I’m ready to try to race this thing. My goal time is 5:10:00, which would be a 9:59/mile average pace. It’s also 30 minutes faster than my current 50K PR (set on the same course), but I think my conditioning is vastly better than in the two previous years. My race plan is to break the distance into three segments. For the eight miles or so to the first aid station, I am going to take it slow, with lots of uphill walking. I’m going to try to get through those first eight miles still feeling fresh, and leave myself a 23-mile race. The next full lap around the lake — 14 miles — is segment two. Here I plan to push it, keep running, and hope to pass some of the people I let go during segment one. That leaves about nine miles for segment three, the “hang on and keep moving” portion of the race. Hopefully I’ll be able to do a lot less walking than during previous years. I started logging my running miles (and at first, some walking miles too) on February 2, 2007. Twelve days after that, I started this blog. 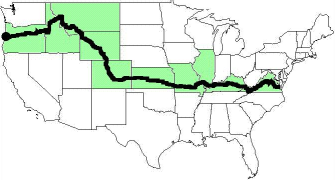 Today is exactly three years since that first blog entry, and this morning I finished my 4,063 mile virtual run across America. What a sweet coincidence! 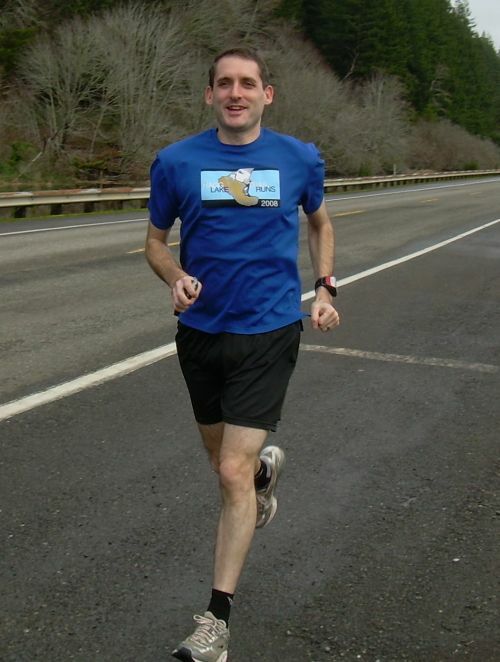 For three years, I logged every mile I ran on exercise.lbl.gov, where I slowly watched the (grainy, low-res) pictures move from the Appalachians to the Plains, to the deserts and mountains, and, finally to the fir-tree rain-forests of my home, Western Oregon. Three years and twelve days isn’t going to set any new records — it’s an average of just 3.7 miles a day — but it’s still an exciting day. 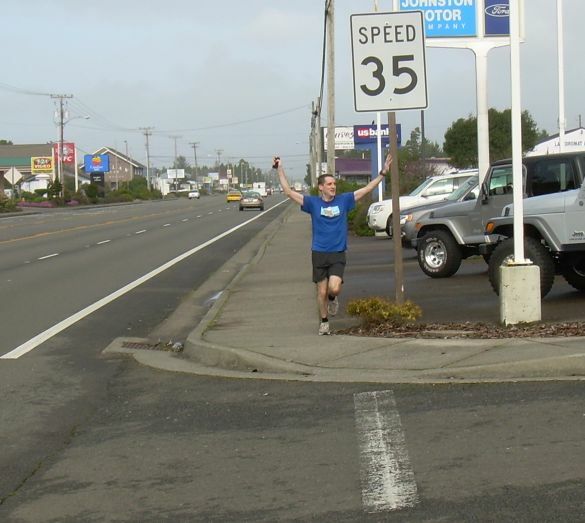 The virtual trans-America trail I’m following ends in the town of Florence on the Oregon coast. A long time ago, Kelly suggested to me that I should run the last miles of the virtual run on the real roads. Since Florence is only 175 miles from Portland, this was a practical plan. And a great idea. Dragging Sweetie along to the coast to take pictures of me as I run along a busy highway may not have been the best Valentine’s Day present for her I could have thought up, but she did a great job. I love you, honey. This was a fun run, even with traffic whizzing by. The beautiful lower stretches of the Siuslaw river run along the highway here. The weather was nice. It was fun to run on a dead-flat road, which I haven’t done in a while. I clipped along with fairly easy 7:30 miles. In my third blog post, I said “I’m curious to see how long I keep this fitness and nutrition stuff up.” Would I have guessed three years? I don’t think I would have. Four marathons and three ultras later, I’m still every bit as obsessed about running as I was then. Where will I be three years from now? All done! Where do I run to next? You are currently browsing the I'd Rather be Running blog archives for February, 2010.